The Ten Worst Couples in Literature? At lunchtime in work, my friend was reading an article about the ten worst couples in literature from The Guardian in which worst means incompatible or better off apart. I didn’t really rate it as a list though, because for many of these books (Revolutionary Road, The Great Gatsby, Jane Eyre, Bridget Jones’ Diary) the reader knows that the relationship featured in the article is meant to be fundamentally flawed. But how would you define the worst couples in literature? For me it would be a couple that I didn’t believe in, or didn’t care about. This entry was posted in Direct Speech and tagged books on February 6, 2014 by Siobhan. You know how every so often you come across an article that really annoys you? So it was when I came across Huffington Post’s A Guide to Pretending to Read Literary Classics. No, it wasn’t just the awkward grammatical tense of the title, it was the principle of the thing. I hate it when people pretend to have read books. It’s invariably because they think it will impress someone, but actually if you are having an involved conversation you can always tell. If you’re doing it to fit in with friends, it’s a little sad. If you’re doing it in an interview you just end up looking odd. My friend was having an interview to read English Lit at an Oxbridge university a few years back and a book came up in conversation that they hadn’t read it, so they tried to bluff that they had. They didn’t get the place. If you’re the kind of person who thinks reading the classics gives you a kind of prestige (or that the books that you read are too, and I quote, “pulpy”) go to the library, take out a book and read it. Then you’ll be able to talk about it. Otherwise, and I recommend this to anyone who is truly embarrassed by the things that they enjoy, go to the library and have a rummage in the self-help section for a book on self-acceptance. Life is too short to people please with your reading material once you’ve left school. This entry was posted in Direct Speech and tagged books, life on February 4, 2014 by Siobhan. Hermione leaves Ron for Harry Shocker. So once again, JK Rowling has cause a kerfuffle among her fans by coming out with another retrospective about her plotting, this time being that she feels that she shouldn’t have had Ron and Hermione end up together. Apparently her decision was wish-fulfillment for “reasons that have very little to do with literature”. Because in good literature the hero always ends up with his best friend who he has no chemistry with, right? While some of the fans reactions quoted in the article above are pretty funny, I can kind of see where they are coming from, because surely the great thing about Harry Potter was the concept of friendship? To reduce it to a retrospective, Harry should have gotten “the girl” (aren’t Hermione and Ginny more than just “the girl/s” dangled as rewards for the conquering hero/es?) risks devaluing some of the core values of the series. I was a bit annoyed when JK Rowling came out with her retrospective “Dumbledore is gay”, not because it isn’t great for Dumbledore to be gay, but because it is and if she wanted to address his sexuality, she should have done it in the books. To come out with the revelation as an after-fact made it reductive, with it appearing as something of a quest for publicity. At least that might have been an attempt to do something positive though, to come out and quibble about something as fundamental as the Harry/Hermione/Ron friendship group erases some of the magic of the series. This entry was posted in Uncategorized and tagged books, entertainment, films, news on February 3, 2014 by Siobhan. Happy February! Can you believe we’re a whole month into 2014 already? Where has that time gone? As it’s the season to be amorous, I thought I’d share some love heart bookmarks I made having been inspired by these cute paperclip bookmarks. I decided to use little wooden pegs instead of paperclips to allow me to use them to string postcards up and brighten up my desk, and they couldn’t have been easier. 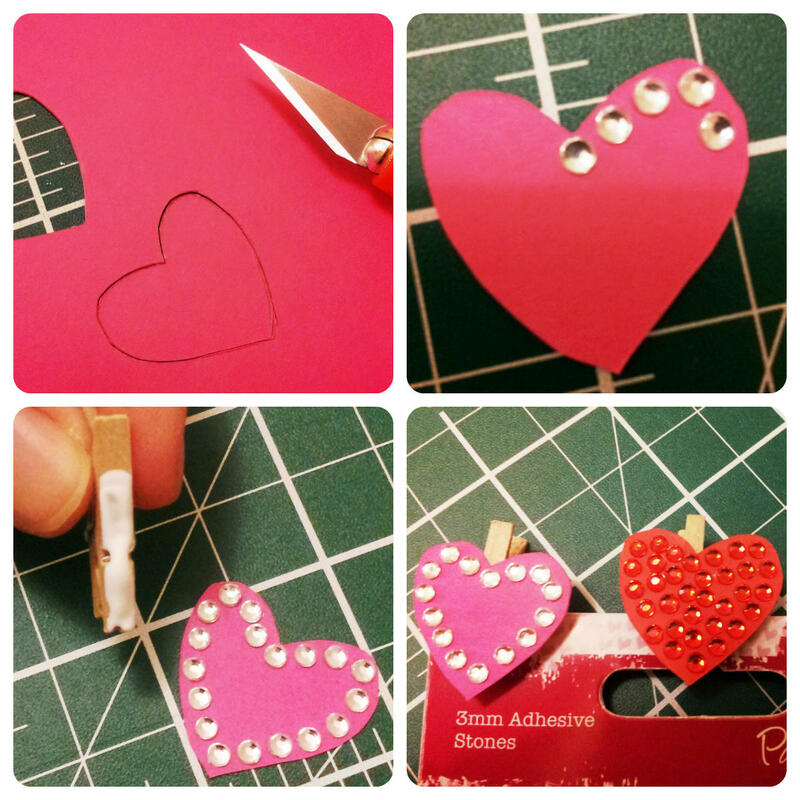 Draw your heart shape on a piece of card and cut out using a scissors or a craft knife (if you want precision). Add your desired embellishments or decoration. Add some quick drying glue to your peg and join it to your love heart. Clip onto a piece of scrap card to hold in position as it dries. Let me hear you sing it now, “Like a rhinestone love heart….” No? Obviously you can play around with this and use different shapes, etc. 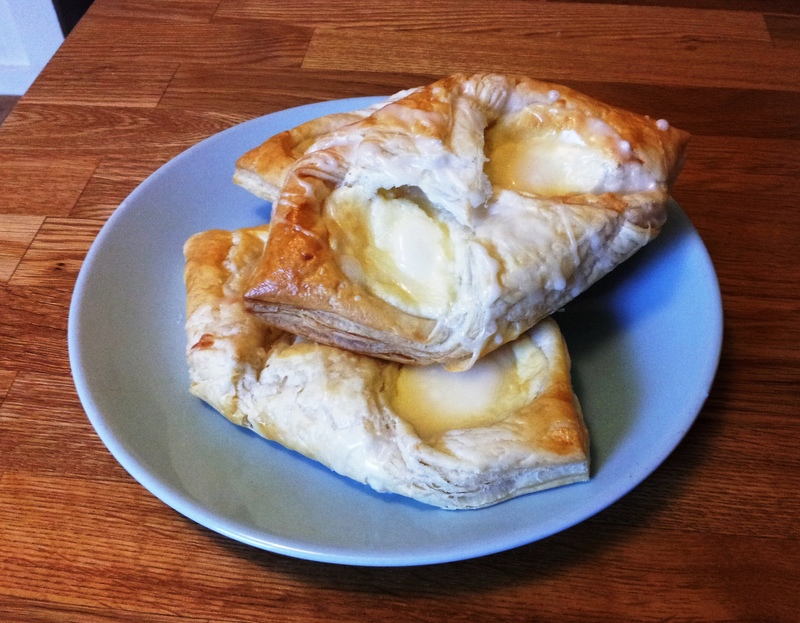 but it’s a very easy emergency homemade Valentines gift… not that you’d ever need one of those. This entry was posted in Craft and tagged books, craft, love, Valentines on February 1, 2014 by Siobhan.